A follow-up to the classic collection on the realities of teaching and learning in urban schools. Of the approximately 50 million public school students in the United States, more than half are in urban schools. 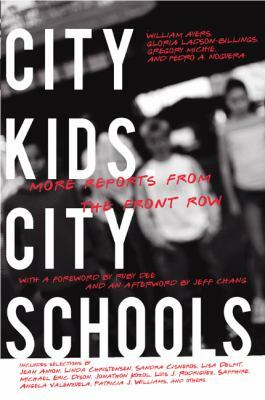 A contemporary companion toCity Kids, City Teachers: Reports from the Front Row, this new and timely collection has been compiled by four of the country's most prominent urban educators. Contributors including Sandra Cisneros, Jonathan Kozol, Sapphire, and Patricia J. Williams provide some of the best writing on life in city schools and neighborhoods. Young people and practicing teachers, poets and scholars, social critics and journalists offer unique takes on topics ranging from culturally relevant teaching and scripted curricula to the criminalization of youth, gentrification, and the inequities of school funding. In the words of Sonia Nieto,City Kids, City Schools"challenge[s] the conventional wisdom of what it means to teach in urban schools. "Ayers, William is the author of 'City Kids, City Schools', published 2008 under ISBN 9781595583383 and ISBN 1595583386. Loading marketplace prices 46 copies from $0.90 How does the rental process work?